A junction of the busy A31 dual carriage way just outside of the town of Farnham is perhaps not the most exciting place to start a walk. But that’s where the North Downs Way begins, and so that was where I stood admiring the elaborate finger post that started me on the way to Dover. The fact that the route initially started heading straight down the aforementioned busy dual carriageway really didn’t inspire much either, but soon the North Downs Way had headed off down down a tree lined track, cautiously moving further and further from the rumbling noise of the traffic. After managing to finally terminate my conversation with Tim and his offers of job interviews I breathed a huge sigh of relief, glad to be away from the stresses and worries of trying to find employment; able to concentrate instead on just putting one foot in front of the other. One foot in front of the other as I meandered down tree lined tracks which led to field edges; field edges which led to country lanes. 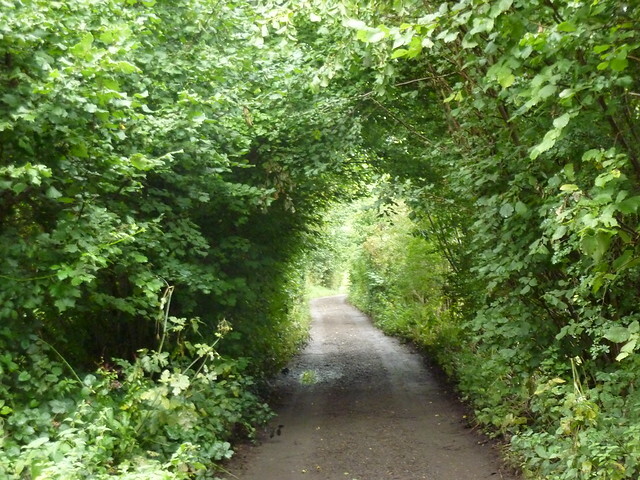 Country lanes which led to woods; woods which led to golf courses. Ah, golf courses. 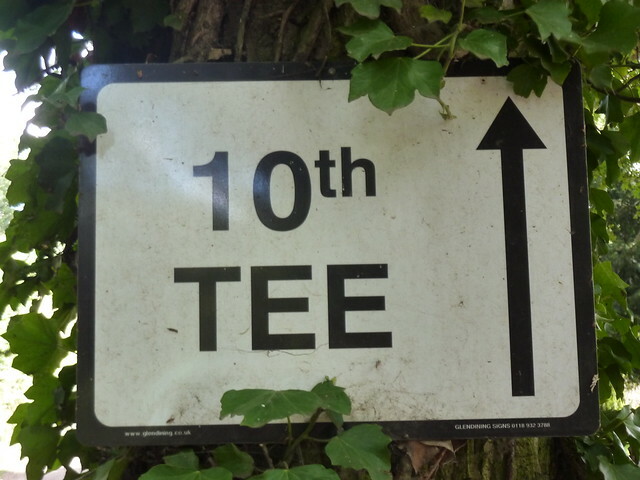 It seems compulsory that, on any National Trail, there is a golf course at least somewhere and the North Downs Way was no exception. Indeed I’d pass two on the first day alone. The odd wisp of cloud clung to the sky but as I left the golfers to find their balls in the rough, the sunlight was beginning to cut through. Ah, the blue skies were coming out. Blackberries seemed to be growing almost everywhere, ripening nicely in the summer sun and I couldn’t resist the temptation to pick the ripe ones, several at once, and let their sweet juices hit my taste buds. There were so many that I wished I’d brought some tubs so that I could take them home with me. The path never seemed too far from a road or village, and off in the distance the giant ridge of the Hog’s Back came into view; the traffic on the A31 that goes over it, occasionally visible. The hamlet of Seale offered other delights in the form of a tree trunk where some of the bark had obviously pealed off in a large strip years before. The result was a tree that looked like it had a tall, narrow door in it and someone had gone to the effort of affixing a house number and a tiny door nob. A sign proclaimed that it was “The Tree House” and miniature bottles sat on the doorstep waiting collection from some pint sized milkman. The woodland walking continued for a bit longer; large and tall trees on each side of the path, many attached with signs proclaiming “PRIVATE. KEEP OUT.” Ah, the friendliness of some landowners. Some of the signs told me that it was a nature reserve which perhaps made more sense, but there were certainly friendlier ways to cover it. A rutted byway led into the village of Puttenham where I knew there to be a decent pub. Lunch at the Good Intent it was and I promptly ordered a Stilton and Ham ploughmans which arrived with so much cheese and good quality ham that it was a marvel they made any money off it. On a nearby table sat a family, a man complaining to his father-in-law about the stresses of his £100,000 a year job and how he was currently talking to another company who wanted to know why he was willing to ditch his role for one that paid 60% less. Ah the joys of rural pubs in the South East of England, I mused. Had I been in the North it would have probably been some sheep farmer complaining about fleece prices, but out here in the reach of London, well the village pub was just a different world. I contemplated joining in, telling them about the joys of trying to live on £70 a week in Job Seekers Allowance, but instead, finished my pint and prepared to head on my way. My first day of walking wasn’t to be a particularly long one, coming in at just ten miles and with two thirds of that done already by the time I’d arrived at the pub, the afternoon was never likely to be particularly taxing. Even so I took it slowly, casually ambling up the track alongside Puttenham Golf Course, following a set of signs that seemed intent on directing me to the tenth tee rather than seeing me on the correct path for my walk. Having sent my ball flying off into the rough never to be seen again, I began to concentrate more on the ever increasing road noise. 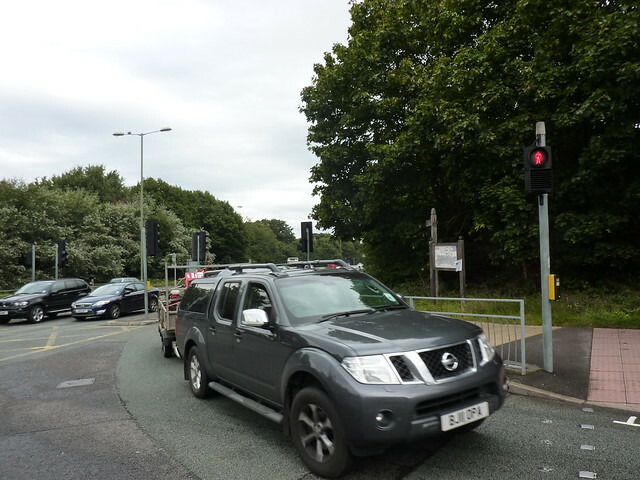 The route ducked under the busy dual carriageway of the A3 and then went under the slip road of the B3000. Two large crosses stood on either side of the bridge. The North Downs Way follows much of what is known as the “The Pilgrims’ Way”, supposedly representing the route that pilgrims took from Winchester to Canterbury. In reality the concept of the Pilgrims’ Way as a single path is actually a bit of an artificial creation, dating back only to 1871 when the route in its current form was added to an Ordnance Survey map by one of the OS surveyors, and even then is so inaccurate and without historical evidence that the Ordnance Survey itself have called it a bit of a blunder. 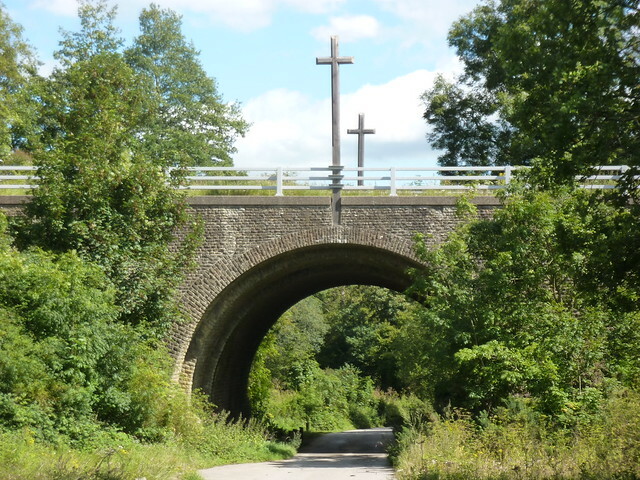 Still, why not let that get in the way of a good walk, although the modern pilgrim would be far better off taking the North Downs Way for most of their journey than suffering the cars and lorries that travel along the busy roads of the South East of England. 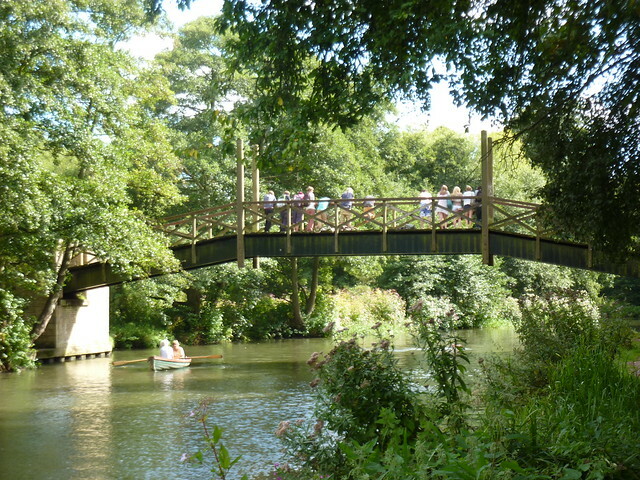 The other side of the bridges led to the Watts Gallery, celebrating the work of English artist George Frederic Watts. Its car park was bustling even on a quiet weekday but feeling disinclined to stop I headed up the sandy track that ran alongside the buildings. Starting off as a farm track it slowly narrowed into a sunken path, surrounded by the inevitable trees; the woods gradually fading out the noise of the nearby traffic whilst acorns lined the path. By the time the path led the woods and began to head alongside fields, Guildford was in sight and soon I was standing on the banks of the River Wey. The bridge with carried the path over the water was full of teenagers who seemed to be busy watching one of their number swim, and as I bade the North Downs Way goodbye I passed alongside a river that was clearly busy on this summers day. Middle aged men pootled up and down in narrow boats whilst school kids took advantage of the summer holidays to practice their rowing. Further upstream, and to much delight of the customers of the riverside Debenhams café, a dredger was busy fishing out shopping trolleys from the water. A huge mechanical arm would drive rapidly to the river floor and pull three or so out at once before adding them to its extensive pile. I’ve never seen the attraction of throwing supermarket trolleys in to rivers but clearly someone in Guildford did, the dredger having fished out a substantial pile. The sun was shining; people were happily wandering in the parks, making the most of the good weather, but the railway station wasn’t far away. I had to get back. My visit was done. I had an interview to prepare for. The rest of the North Downs Way would have to wait a while. Next time: the weather isn’t quite as good and there’s no boats punting, but there is a walk to Westhumble to do and it does go via a vineyard too. 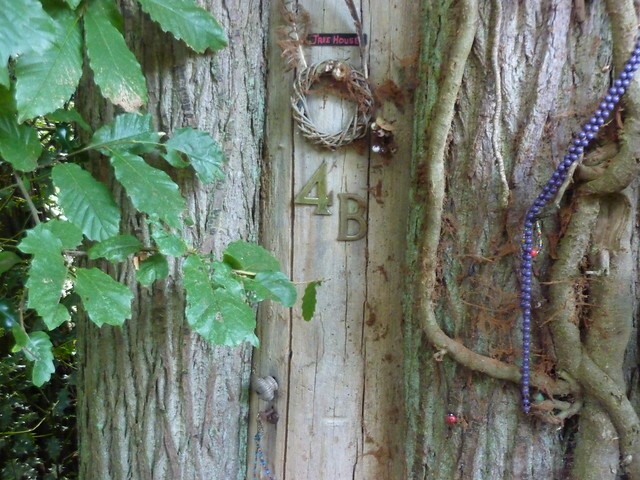 Was nice to see the crosses on the North Downs Way, and that they are still there. My father re-built these crosses about 50 years ago. Rumor has it that they should last about 200 years, and also there is a time capsule in one of them, from our family. Hope it gets found sometime in the future. Just completed the first leg of the NDW. We did it without a map or guide, relying on just the signs. Bit of a mistake!! Some of the sign post were down and some of the signs are small disks nailed to posts which can be easily missed. We missed two which added on an extra 1.5 miles. Getting a guide for the next leg 🙂 But really enjoyed it, specially a beer at the pub in Puttenham! First Published: 10 January 2013. Last Updated: 16 November 2014.